The poignant darkness within music can sometimes be thrillingly beautiful. The power within the shadows can transcend imagination, time, and space. Some listeners love depressing lyrics or themes while others may just love the dark image or style of the group. When The Jesus And Mary Chain sang “I’m happy when it rains…”, many listeners felt a connection to this psychological phenomenon. In essence, misery truly loves company. Music is a magical art form in which people can discover joy within sadness. Michael Allen, formerly of The Wolfgang Press and Rema Rema, explores this beautiful darkness in his new group, Geniuser. The Wolfgang Press was unlike any contemporary music group. They utilized multiple influences to create a magnificently unique sound that transcended categorization. Signed to 4AD, the band’s early albums (“Standing Up Straight” & “The Burden Of Mules”) were insanely bleak. Lead singer, Michael Allen sounded as if he was literally being dragged to hell. Allen’s deep baritone voice was an unlikely driver for any pop group. The wisdom that resonated thru the songs helped to create their exquisite music. Similar to Mark E. Smith, Allen’s performance was respected regardless if his voice. Eventually, the lyrics, the intelligence, the passion, and the music made listeners appreciate his inimitable vocal tone. His vocals became more tuned and soulful with every changing album. Influences of soul music slid into the “BirdWoodCage” LP. When their very successful “Queer” LP was released, the soul music was intertwined with electronic rhythms and Manchester rave culture. Their classic cover of “Mama Told Me Not Come” displayed their ironic, intelligent wit over thick grooves. Their clever topics and lyrics led to multiple interpretations and their music set them apart from the throwaway bands of that time period. Their final LP, “Funky Little Demons” was an overlooked masterpiece that displayed the Press honing their sound to an English Soul / Blues style. Excellent tracks like “People Say”, “Chains”, and “She’s So Soft” varied in styles, but were linked by the group’s cool passion. Years later, every album by The Wolfgang Press is completely unique and magnificently timeless. Like fine wines, Michael Allen’s music gets better with age. After The Wolfgang Press disbanded, many years passed before fans heard new music from any of the members. Andrew Grey released his solo album “Homegrown” under the moniker Limehouse Outlaw. Lead singer / songwriter, Michael Allen did contribute vocals / lyrics on Limehouse Outlaw’s album, but their cult-like fan base yearned for more music. The use of Johnny Cash’s vocal sample did excite fans with glimpse of a possible new direction. Unfortunately, years after the album was released, Grey and Allen were missing in action within the music world. After more than a decade, Michael Allen returned in 2005 with another unique musical contribution named Geniuser. As always, Allen’s new project a complete separate entity from his past work. Geniuser consists of Giuseppe De Bellis and Michael Allen. Hailing from Italy and known for his collaborations with The Orb, Giuseppe De Bellis has released a myriad of music under various names. Drug maestros, The Orb lent them their studio and the magic was ignited. Released on Phisteria Records, “Mud Black” by Geniuser possessed a moody darkness, esoteric lyricism, and an emotional intensity. Allen has not created music this dark since the days of “Standing Up Straight”. Actual songs exist within the darkness. The opening track, “Untie My Hands” introduces the complicated emotions which lay deep within this album. Tapping into his deep emotional core, Allen sings, “…Untie my hands / Untie my heart / So I can hold again…” The mixture of beauty and sadness become the perfect introduction to this expressively complicated album. In the “You Can Lose It”, the pounding of the thick electronic bass becomes essential like a pumping heart. Allen’s thick vocal styles are accentuated by his imaginative lyrics. “…You can lose it / You can fall…”, Allen sings with a sharply blunt style. “This Is What I Know” and “These Times” also have Allen using his deep vocal tone to create a unique sound and dark atmosphere within the loose pop structure. The final track, “Utero” uses a rich, electronic rhythm for Michael to show us the door to leave the album. “…Inside is warm…”, Allen repeatedly sings, providing multi-interpretations. The “Mud Black” LP by Geniuser may go unnoticed, but the few who find this gem will be musically rich. Art is usually not fully appreciated until the artist is gone. Even though Rema Rema and The Wolfgang Press have been relegated to the past, Michael Allen’s creativity is shining within the darkness. A new appreciation for Allen’s work has grown too. 4AD released the “Everything Is Beautiful” compilation and just released The Wolfgang Press’s debut album, “The Burden Of Mules” for the first time on CD. Fans can look to the past and finally appreciate The Wolfgang Press. Others are beginning to appreciate Allen’s current collaboration with Giuseppe De Bellis. 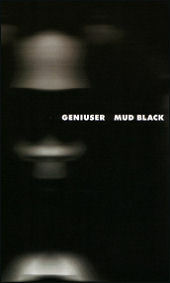 “Mud Black” by Geniuser satisfies fans of Allen’s past work, but continues his exciting musical evolution. Allen has settled down with his wife and family, but the creativity still flows through his veins. Strange and intelligent, Michael Allen will continue to surprise us within the mud black of darkness. Michael Allen: Too much to mention and little of interest. MVRemix: Tell us about the debut Geniuser album, ‘Mud Black’ released on Phisteria Records. Michael Allen: It is an album of songs that myself and Giuseppe started work on as far back as 1999. They were ideas for songs that were meant to give a flavor of what we were up to, at that moment in time. We thought that by offering these sketches to the outside world, somebody of taste and position would be interested enough to offer us unlimited resources, so that we could complete the project. That didn’t happen. MVRemix: What is the meaning behind the title, ‘Mud Black’? Michael Allen: There isn’t any meaning. It was more that I liked the sound of those two words when they were put together. Having said that, I suppose I was looking for something that suggested what we felt the album was about, which is dark, certainly naïve, and deliberately lo-fi. ‘Mud Black’ might suggest something primal and guttural. MVRemix: Phisteria Records released ‘Mud Black’. Why did you choose them? Michael Allen: They chose us. After Giuseppe and I had finished recording the ideas, Giuseppe went back to Copenhagen to live. I think he had spoken to a couple of people and friends. He told them that he had worked on some pieces of music with myself. People got to hear it and Karsten from Phisteria must have caught wind of this and expressed an interested in wanting to put the material out. MVRemix: How is this Geniuser LP different from the previous music you have created? Michael Allen: It’s different simply because I was working with Giuseppe for the first time. The process, I suppose, was different in that Giuseppe initiated most, if not all, of the tracks. Then, I came along and would maybe introduce the more conventional sounds, bass, piano, and strings. I would then, add a rough vocal idea. We then arranged the track, and I recorded the final vocal. "I was looking for something that suggested what we felt the album was about, which is dark, certainly naïve, and deliberately lo-fi. ‘Mud Black’ might suggest something primal and guttural."